One may wonder at the relevance of a video conversion software. The value of a video conversion software will not be appreciated until you find yourself in one of these situations. In preparation for a vacation trip, you just went to the market and purchased a mobile device with advanced media capabilities alongside a camcorder. You went on your trip and recorded all the memorable events. Finally, on returning from your trip, you transferred the files to your mobile device only to receive the message, “File Format Not Supported”. Second case, you are surfing the web, performing some research and you find this video that is relevant to your quest. You downloaded it to your device and upon selecting it to play, you see the message, “File Format Not Supported”. Maybe you are in the office and your colleague has a video file in his phone that appeals to you. You asked him to send it to you by Bluetooth, he does, and then you discover that the file does not play on your phone. You are wondering, “It plays on his and does not play on mine, what happened? Maybe the file is not good.” No, the file is perfect, it is the file format that is not supported by your device. If you have ever found yourself in any of the situations mentioned above, you will know that it is a very frustrating and disappointing moment. Video files come in different formats. These formats are not supported by all devices hence the need to convert them to the supported format. There are some popular formats like AVI, WMA, MOV, MPEG and a lot others. The problem is that these formats are not supported by most mobile devices. They need to be converted to a format that is compatible with your mobile device. This is where a video converter comes into play. Video converters are applications that are developed to convert the format of a video file from one to another, making the file playable on a specified device. An example is converting an AVI file format to an MP4 format. The former plays on your PC but not on your phone so it need to be converted to MP4 which is playable on your phone. In other cases, if you have a Google Nexus 10, you will not be able to play MKV files and so on. Here is a list of some of the value of video conversion. Video conversion allows files that could not play on your device to become playable and in most cases, maintains the quality of the original file. 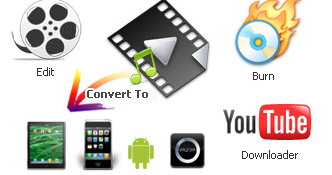 Some Video converter applications have video editing features that allow users to edit video files to their taste. The interesting part is that you do not need to be a professional to use these applications. They are easy to use. The limitations associated with these mobile devices are overcome with video conversion applications. Video conversion makes you easily work with files on the go as you do not need to be with a standard computer to access those files. They can be converted to the format that your device supports and you work with them. Typing in google search engine, “Video Conversion Software” displays lots of companies offering you so many video conversion tools expected to deliver as they say. But to get the best from these tools, prudence is required. The best I have used so far is Wondershare Video Converter. I have compared it with some others and it is way ahead of the pack. Its conversion speed is several times much more than the average speed. Its ability to handle multiple conversion sessions is unparalleled, combined with a user friendly interface. Take advantage of this and enhance your video conversion experience today. About the author: Christine Smith has been a freelance writer for 6 years and a contributor for Wondershare, her writings are mainly focused on technology or similarly interesting software. She also likes to share some great tips on and off, purely based on her personal experience.